The Fortune Cat! It's lucky! But WHY is it lucky? Some people say the cat beckons good luck to come to you! Others say it holds the secrets of prosperity in its paws! Still others don't know what a Fortune Cat is, and shouldn't be asked about it for that very reason! 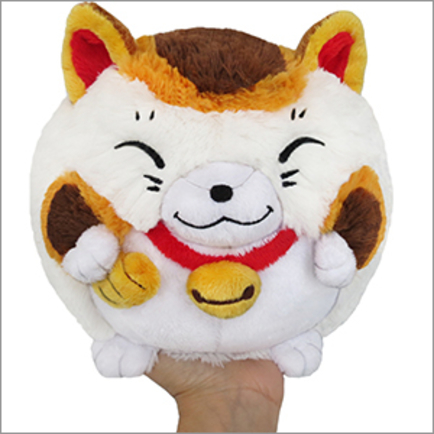 But when it comes to this particularly charmed kitty, and its full-sized Squishable Fortune Cat cousin, we know EXACTLY how it works!! The luck-delivery method goes like this: Admire the Fortune Cat's cuteness. Pet its silky-soft fur. And then, suddenly, you will feel super lucky to have something this adorable and cuddly in your arms! No mystery here, this is one fortunate cat to have around. 7 squishy inches of identity property of luck, polyester fiber, ages 3 and up!